Star quality? Restaurant James Sommerin, Penarth. I am not one to really celebrate my birthdays. The longer in the tooth (feel like I am approaching sabre tooth) I get, the more I tend to want to brush the whole birthday malarky under the carpet and just treat it as a normal day. You bloody miserable git you may think and you would be absolutely right about that. The extent of any celebration (I tend to try and be abroad on my birthday if at all possible – not to be this year for various reasons not least my mad mother being at Glastonbury and thus unable to look after the dogs) entails a (hopefully good) meal out. This year, with a bit of advance planning, presented the ideal opportunity to finally sort a night out with (very hard to pin down for a night out) friends from Penarth (one of whom I work with – Rachel – and one of whom I use to work with – Fraser, before he tunnelled under the wire and escaped) at the Michelin starred (one of two new ones in Wales in 2017) Restaurant James Sommerin (been dying to try it out for an age). 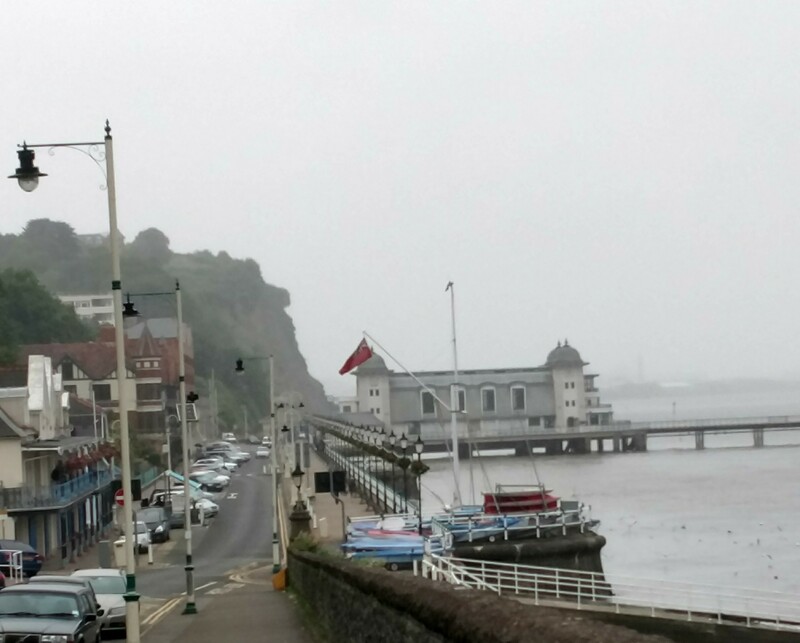 It looks out over the sea and Penarth pier and the views must be lovely on a nice day/early evening (not to be on date of our visit regrettably). On the outside it is rather unassuming. Easy to walk past if you didn’t know it was there I though. 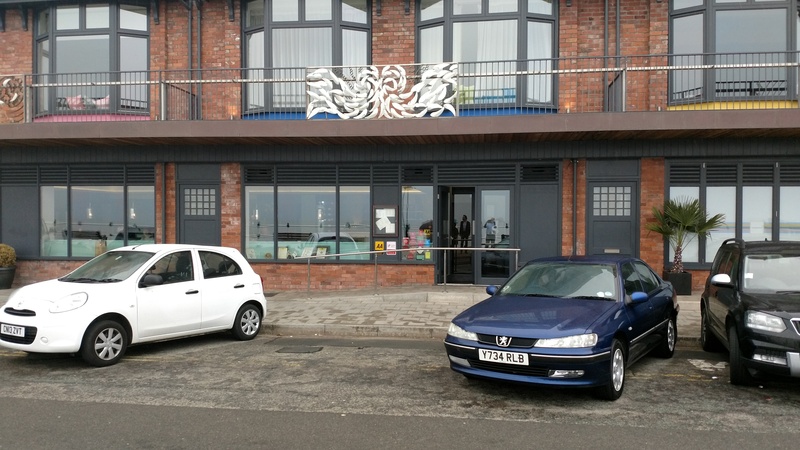 Car parking space outside Rach – remind me again why we had to walk in the rain! Inside it is classy, but understated which I quite like. Not one for bling me and nor it seems is Mr. Sommerin. I love the fact you can look into the kitchen. Have to say it seemed remarkably serene in there. Clearly a well oiled machine at work, but I was a tad disappointed it wasn’t just a little bit frenetic. My friend, Fraser, is one of the fussiest eaters (over the age of 10) I have ever come across (the advantage is I always eat very well if I am out for dinner with him) and as a result “surprises” food wise are not his thing at all. We, therefore, all decided discretion was the better part of valour and opted for the shorter non surprise one (hoping for an amuse bouche or two with it, on which we were not disappointed). Light as a feather gougères had a gorgeous intensely cheesy filling and an almost ethereal garlic espuma (with toasted seeds, including some standout, punchy, fennel seeds) were a delight. The real star of the amuse bouchés, however, were some tapeoca crackers topped with intense, whipped, taramsalata – just stunningly good and light years away from the crap you get in tubs from the supermarkets (I ate mine and Fraser’s). Some lovely bread then made an appearance. Out of a choice of 5 or 6, I went for the onion bread. Lovely with the seaweed butter it came with. I was less enamoured with the unsalted butter (bit like decaff. coffee unsalted butter in my opinion i.e. pointless). We did ask for some more of the lovely seaweed butter, but alas it never got to us. 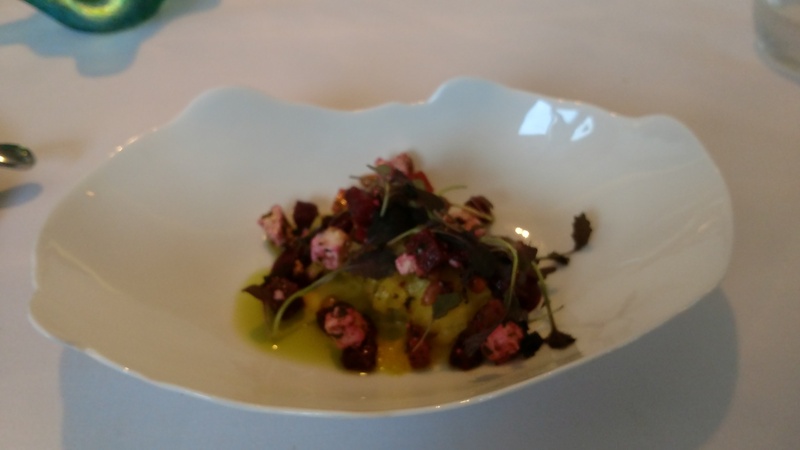 The first “proper” course was a lovely medley of beetroot. Cubes of earthy purple beetroot melded perfectly with salty feta and toasted pine nuts, with it all sitting on golden beetroot tagliatelle (i.e. spiralised). The golden beetroot had a lovely bite to it and was bathed in a warm, rich and uber buttery sauce. Not perhaps the most asthetically pleasing, but perfectly cooked with simply divine flavours. 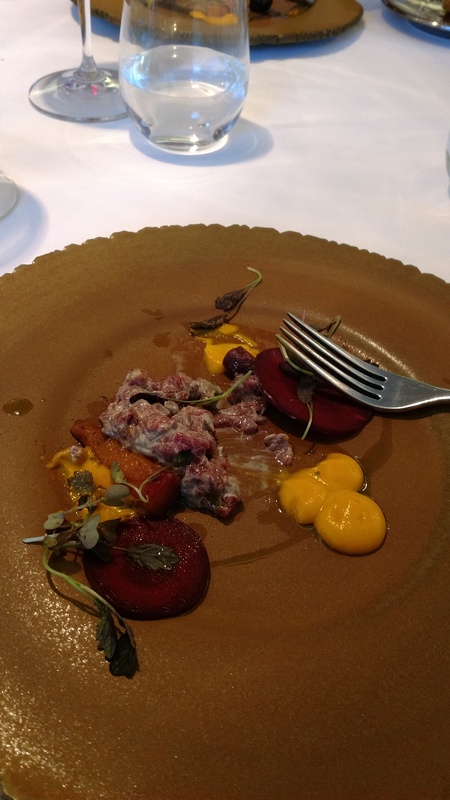 Next up (much to my friend Fraser’s horror, who likes his meat nuked and then baked on the surface of the Sun to a carbonised crisp) was a venison tartare (I ate his, as based on the look on his face he would have rather eaten the plate than the tartare). Pretty as picture with flavours to match, the gaminess of the venison was complimented by earthy discs of beetroot and mushroom and the sweetness of carrot (in baton and puree form). An anise hit, from the tarragon based sauce the venison was laced with, refreshed the palate nicely offering a pleasing counterpoint to the richness of the meat. Top quality ingredients and great flavour combinations. I loved this – super dish. Beautifully thin and perfectly made pasta encompassed a very generous amount of lovely, sweet, langoustine meat. 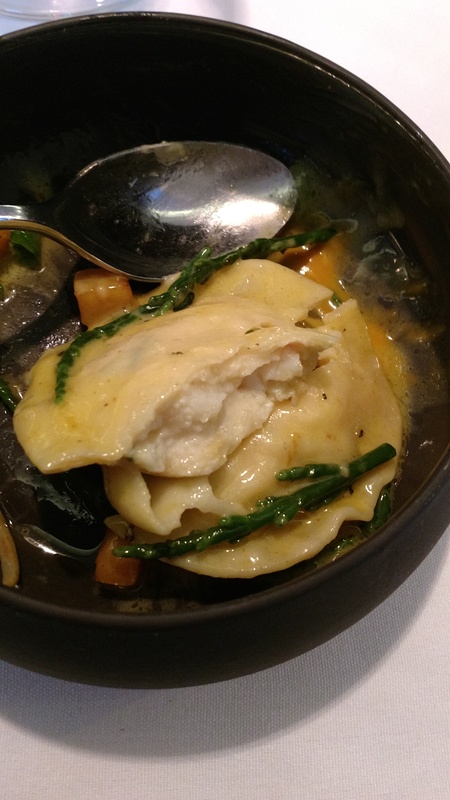 The ravioli had with it some barely blanched broccoli florets and crisp, briney, samphire. These added some nice contrasting textures as well as flavours to the ensemble. A lightly curried butter sauce brought it all together nicely . 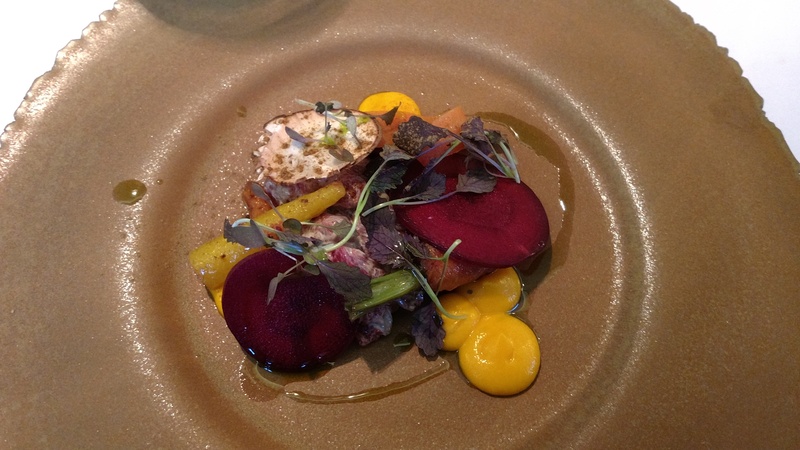 A cracking dish that got vigorous nods of approval from all of us (even Fraser). 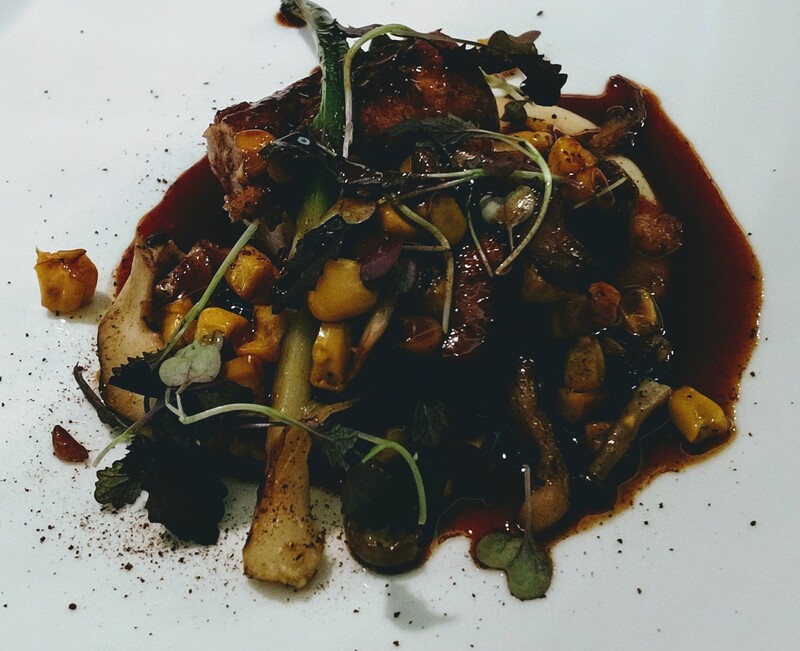 The guinea fowl was perfectly cooked (lovely and moist, with a delicate gaminess to it) and came with an intriguing fig sauce. I was somewhat sceptical about this, but it worked very well with the sauce having a great depth of flavour (the fig really came through) without overpowering the delicate nature of the bird. Just done kernels of sweetcorn added a nice splash of colour and a bit of bite, whilst truffle and globe artichoke brought their own unique flavours to the equation. In less skilled hands this dish could have been a car crash, with a refined touch required to ensure balance. Here it was just right and got a big thumbs up from our party . 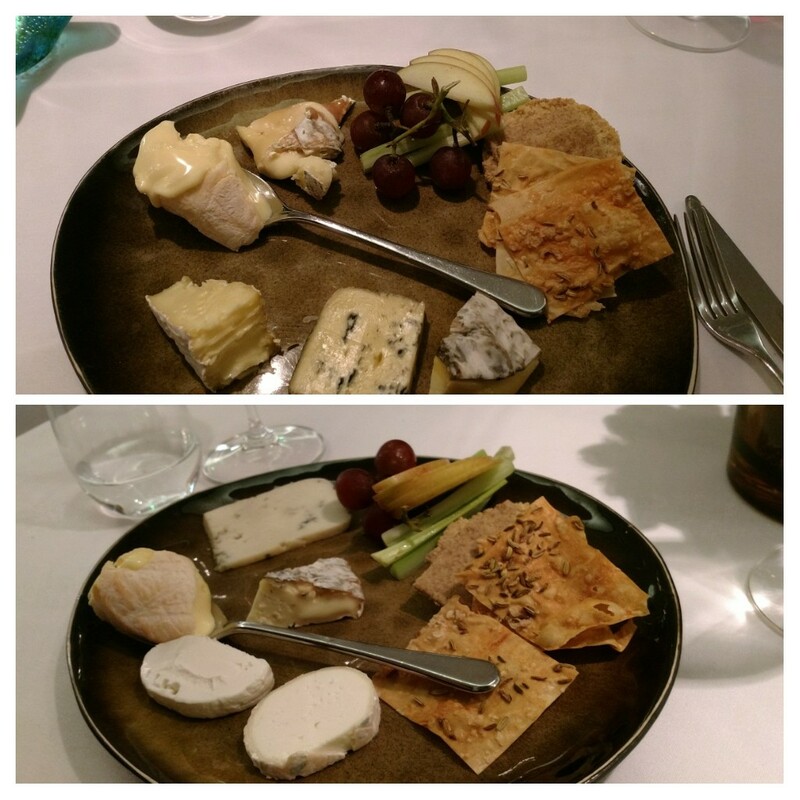 You can add a extra cheese course (£12 per head for 5 cheeses, which two of us took up but in reality it was enough for all four of us ). 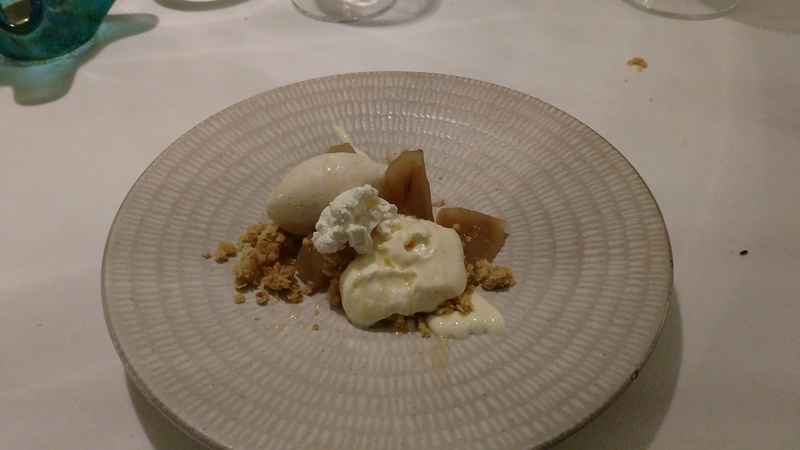 The first pud was a poached pear (infused with cinnamon) affair, with a nice flapjack crumb, a freeze dried coconut concoction and a good hazelnut ice-cream. Very nice, if perhaps a tad pedestrian as against what had preceeded it. 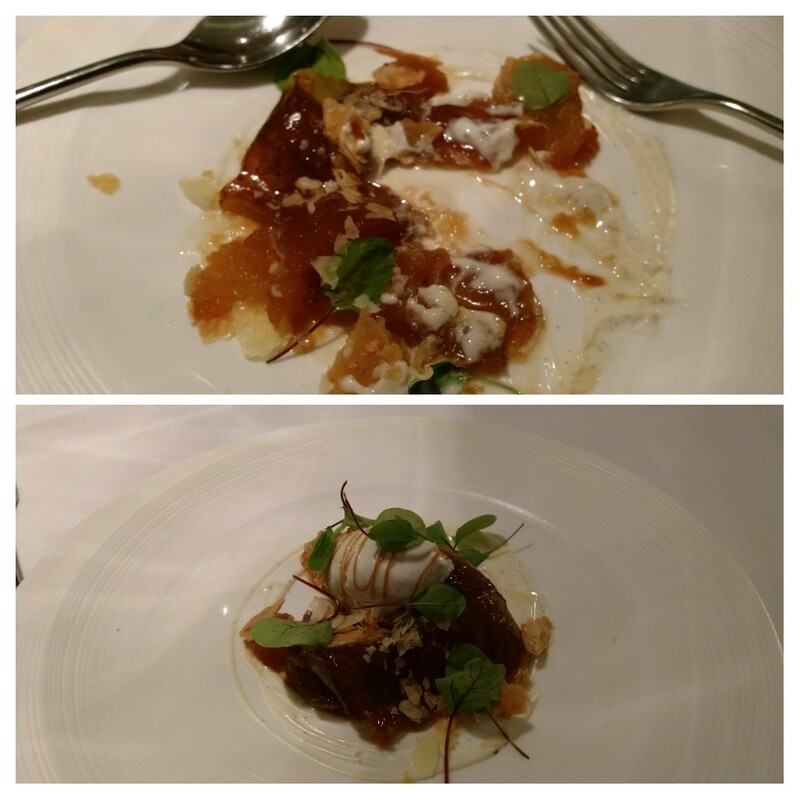 The final course was a sort of tarte tatin. Nicely caramelised, yielding, apples with some lovely flaky pastry made for a very pleasant and surprisingly light end to proceedings. Very welcome after what was quite a big meal. 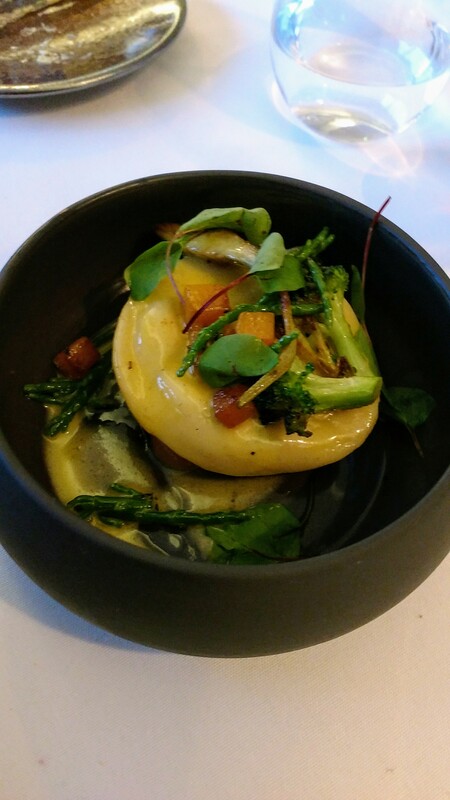 My only qualm was the green shoots on the dish. I had assumed these would bring some interesting flavour to the dish. Don’t know exactly what they were, but they tasted like bog standard green leaves to me, so not sure what they bought to the dish. Perhaps there was a subtlety of flavour to them that was lost on me, but if so no one else in our party got it either. 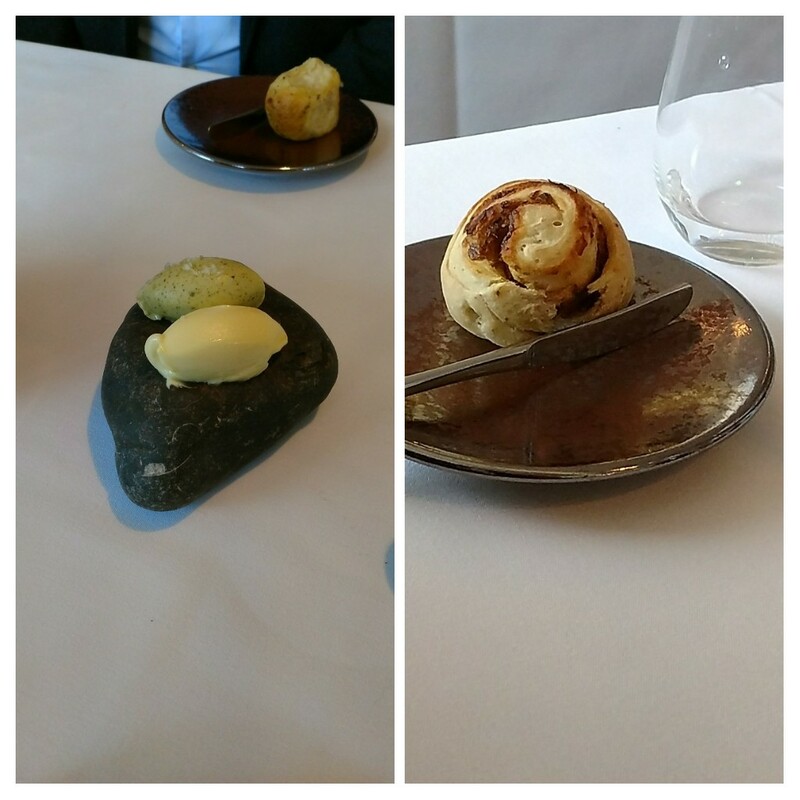 Personally, I would have preferred an extra savoury course and just one rather than the two desserts we got (but I don’t have much of a sweet tooth). The night on this front got off to a bit of an odd start. As readers will know, I am a sherry nut and Finos and Manzanilla are lovely pre – dinner drinks (they are also great with food). The plot thickened when I was given the wines list and told in fact they did have some sherries just no Manzanillas, which again surprised me as on the list was a La Gitana Manzanilla (£4). I mention this and after going away to have a look it transpired they did have some, but only a glass. 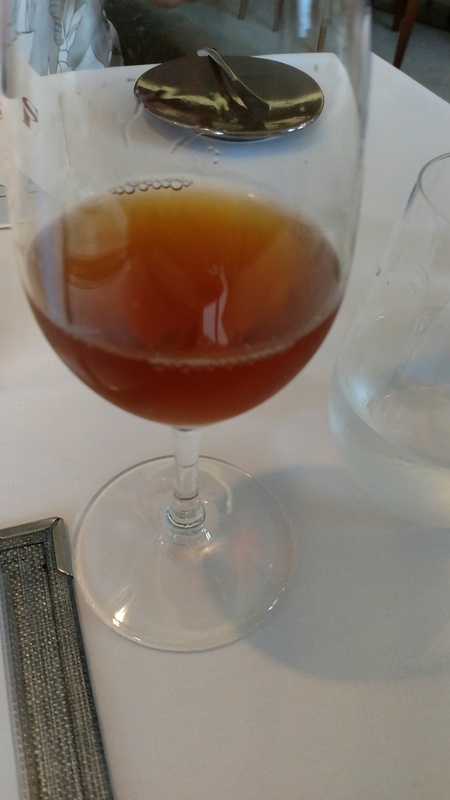 Mrs. SF had that and I (slightly vexed and thinking how long has that bottle of La Gitana been open – it was actually fine) decided instead on a glass of the Leonor Palo Cortado (£4.80). Nothing wrong with the sherries on the list bar from their limited and rather conservative nature (I think a Michelin star deserves some more exciting stuff like Urium from Sherry Boutique and /or Equipo Navazos sherries on the list) and some quite aggressive pricing. £4 for 70ml (for the La Gitana) equates to just under £43 a bottle (with La Gitana retailing often at below a tenner, that is some mark up). Curado Bar, in Cardiff City centre, will sell you a cracking Manzanilla (a La Goya Pasada – which retails at around £13 a bottle) in a bigger glass for £3.50 (100ml) or £4.50 (150ml). Seemed to me that the sherries are a bit of an after thought here, which to my mind is a great shame as they are fabulous food wines. I actually think sherries from Manzanilla all the way up to Pedro Ximinez would have worked as an excellent wine pairing flight for the taster menu here. Anyhow enough of me whinging about the sherry (I invariably find something to whinge about wine wise and haven’t finished – I can almost hear the groans- on that front yet I am afraid). 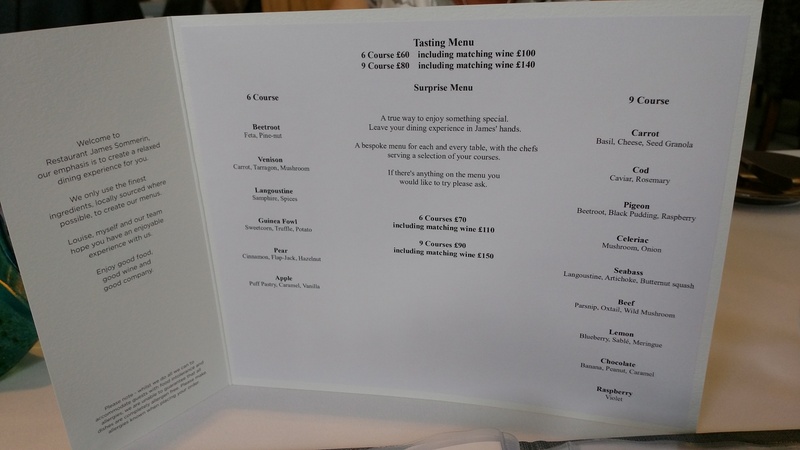 Back to the main list, the place provides the option of wine pairings with both the 6 and 9 course menus, but at £40 a head for the pairing with the 6 course menu (£60 for the 9 course one) that would have equated to £160 (a whopping £240, if we had gone for the 9 courses) for the 4 of us for wine. Looking at the wine list I was content to choose a couple myself and save a bit of cash, particularly as the friends with us are quite light drinkers. 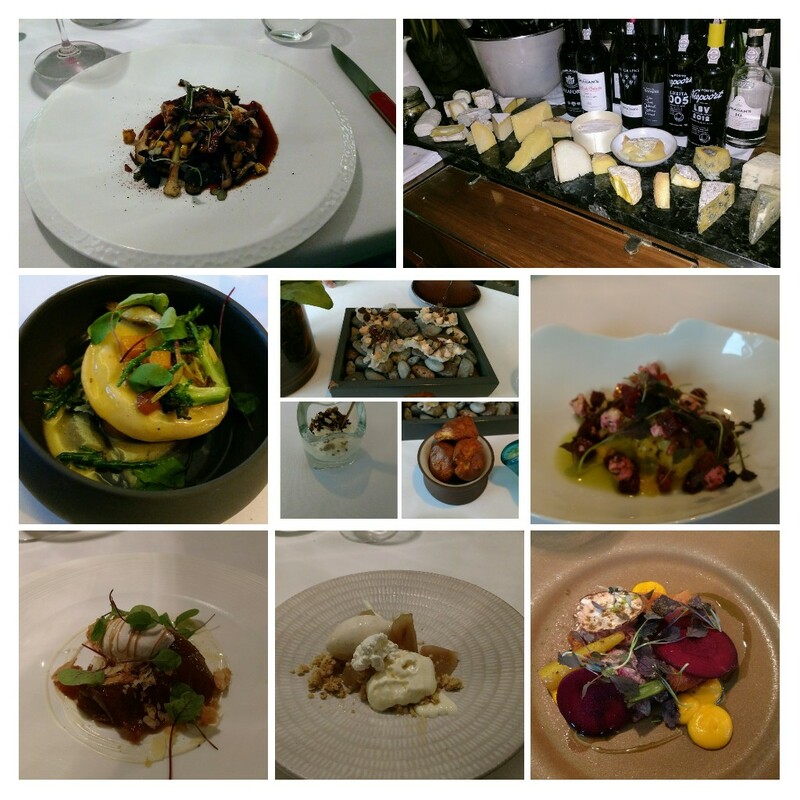 Wanting a good all rounder wine that would work with the varying savoury dishes on the tasting menu, the list had plenty to offer. 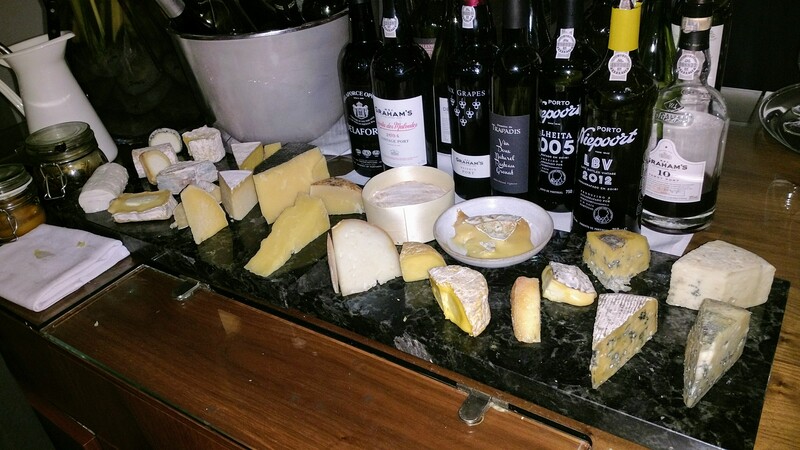 For me it was a choice between the 2013 Hugel Classic Gentile (£39 – £14 retail), the 2010 Allen Scott, Moorlands, Riesling (£43 -£15 retail), 2014 Mitchell Watervale Riesling (£38 – £13.40 retail ), 2013 Donnhoff Riesling (£48 – £15.50 retail) and the 2014 Jurtshitsch Gruner Veltliner Terassen (£32 – £10 retail). 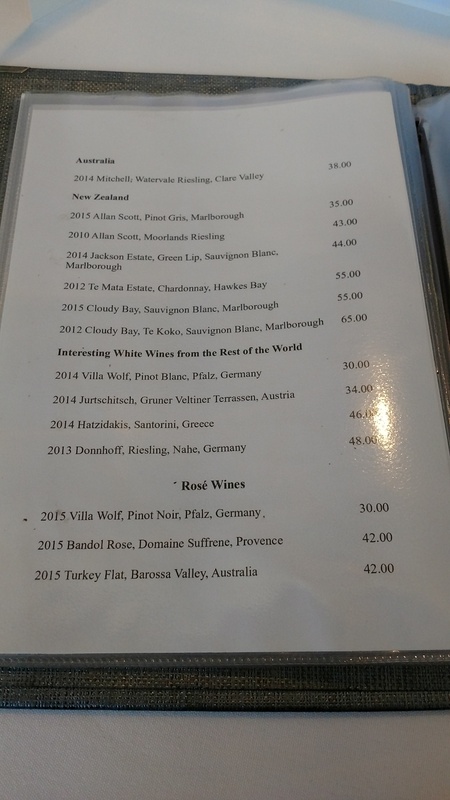 Whilst tempted by that most versatile of food wines an Austrian Gruner Veltliner, I decided on a bottle of the Mitchell Watervale Riesling (which got a whopping 95 point score from James Halliday – am loving Aussie Rieslings at the moment). Lovely bone dry wine this, with a whiff of petroleum on the nose and zesty, refreshing, lime on the palate. 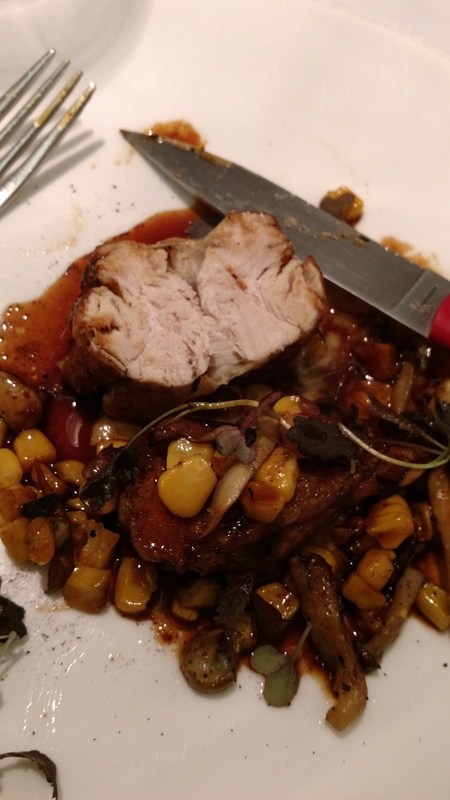 It worked well with a number of the dishes. Whilst my preference (based on the menu) would have been two whites (probably the Gruner on top of the Riesling), after a mini debate the majority decision (I was out voted) was to have one white and one red. Mark ups on the reds are particularly aggressive (Meerlust Rubicon 2013 retails in Costco for a smidgen under £18 – great wine for that price – but the 2008 is £87 on list here and a Chateau du Pez 2009 is on the list here at £124 when it retails at around the £40 mark) which is a shame. 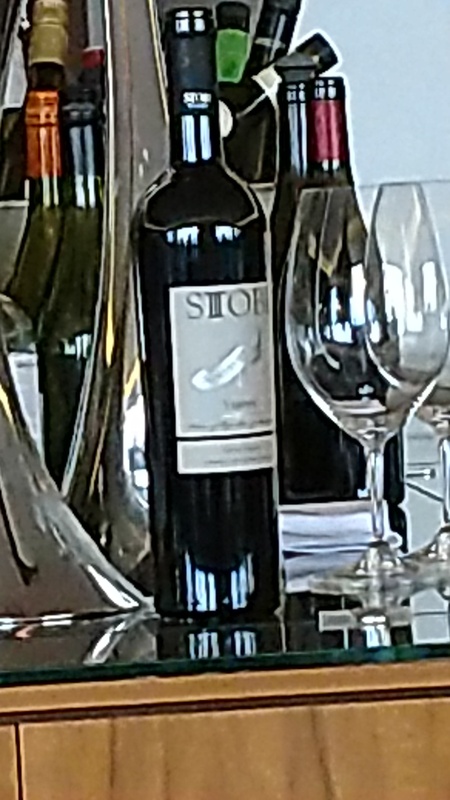 At the lower end of the list (the cheapest red wine is £26 and there are only 2 reds on offer below £30) I spied a Stobi Vranec (a Montenegro wine which I have rarely see on lists over here) for £32 (retails at around £10) and thought it would be an interesting wine to try here. Very pleasant, with mocha, dark cherries and hints of liquorice. Great with the venison, but it would have been nice if it had been left on the table rather than spiriting it away. Find that practice rather annoying, as I think I am old enough to be trusted to pour my own wine. and I had a glass of the Graham’s 10 year tawny (£5.50), which was lovely with my cheese course. I was very impressed with the food at this place. Not a duff dish delivered and some really good ones. The stand outs were the langoustine ravoli and the guinea fowl. 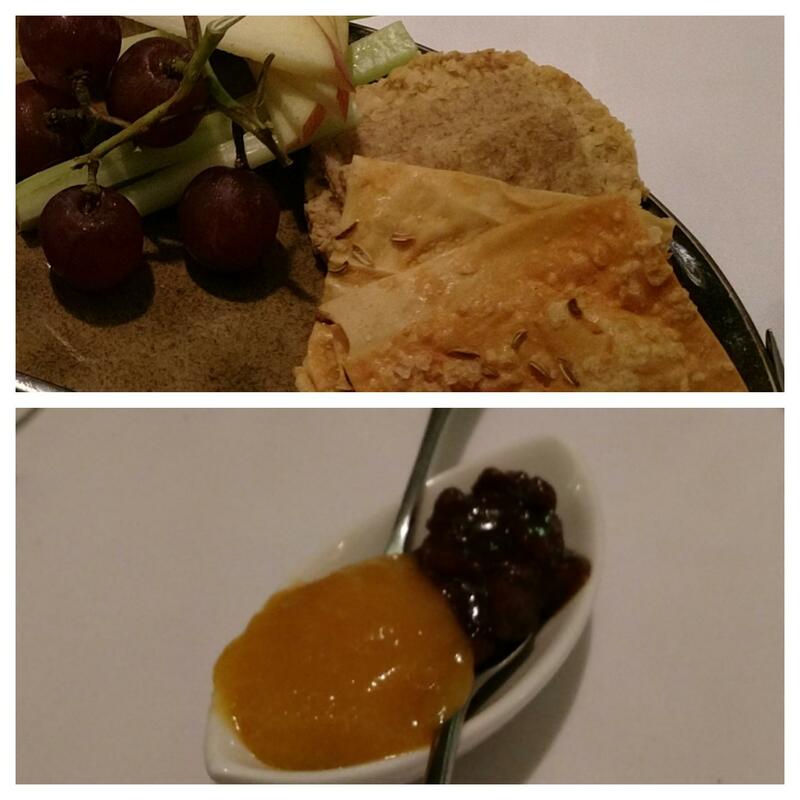 The savoury stuff was, to me, a step up from the desserts. What I really liked is the kitchen didn’t feel the need for any fancy foams or silly props, with the quality of the ingredients and the cooking doing all the talking (is it just me or has the Great British Menu just got silly with the use of props – saw stuff served on a tennis racket on the latest series). 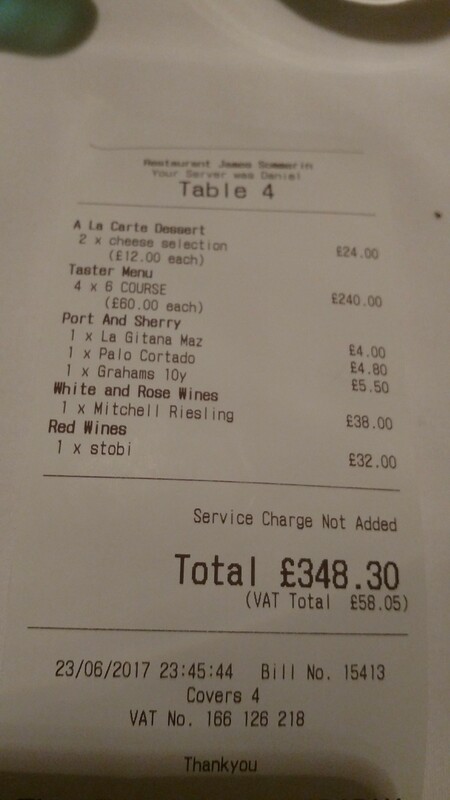 We paid (less a tip – service, sherrygate and wine not being left on the table aside, was good) just shy of £350 for four with a reasonable amount of booze. I though this fair for the quality of what we had. Only real gripes were wine related. I wish they priced their wine like the Spanish Michelin starred places I have been to (a beefing up of the sherry offering and leaving wine within reach would also be nice). 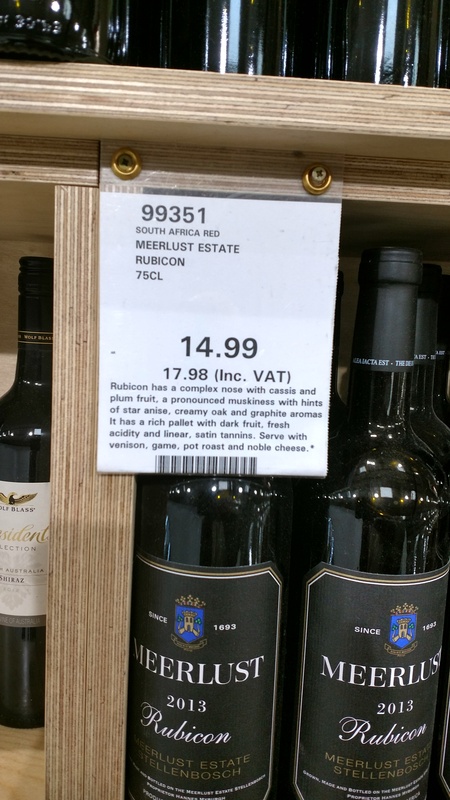 Personally I just cannot see the justification for charging £87 for a wine (the Meerlust Rubicon on the list – good as it is) that retails at under £18 in a place (Costco) a mere 5 miles down the road. Whilst the one on the list is a different year, being a 2008, the prices seem similar for the 2013 and 2008 vintages on the web and, if anything, the 2013 is seen as the better of the two vintage in South Africa. To put the £87 in context if they charged £50 corkage (which I am sure everyone would agree would be outrageous) it would still be nearly £20 cheaper to buy a bottle of it retail and pay the corkage. That, to me, is madness. In fairness wine mark ups across the board in the UK restaurants tend to be seriously high (their are notable exceptions), so this place is by no means alone (a price nigh on 5 times retail is one of the most aggressive marks I have encountered in the UK mind). The fact, however, that nearly everyone in the UK does it doesn’t make it right. 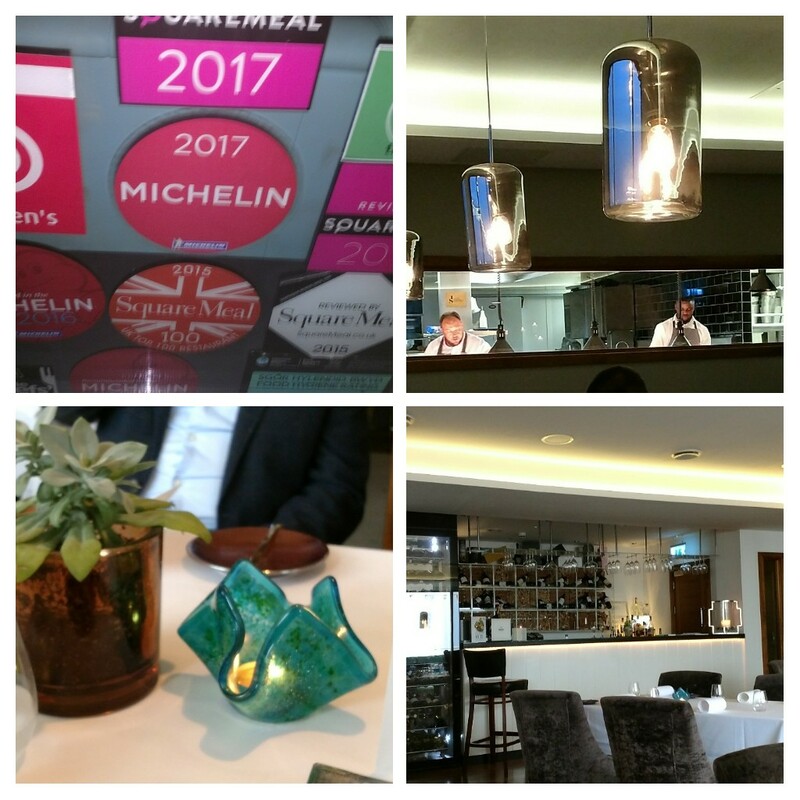 If Spanish Michelin starred joints can apply a reasonable (30% – 60%, at worst 100%) mark up over retail (which at the higher end tend to be comparable in Spain and the UK) why can’t those in UK? I can live with 2 times the retail price and sometimes even 3 times (albeit through gritted teeth), but 4 times + – nope, never. It seems to me that wine is all to often seen as a cash cow by restaurants, but price to high and people simply won’t buy. My view is price sensibly and you will create your margin by dint of selling more. I may well have ordered the Meerlust Rubicon (lovely drop) if it had been say £40 – £45 (which would have given a margin of £22 – £27 on a single bottle and seem more than reasonable in terms of a return on it (not as if have to do anything to it other than store it correctly, although I suppose there is VAT to consider). If no one buys it (and personally I think anyone would be mad to buy the Meerlust Rubicon at £87) then it just sits there and the restaurant gets nothing. More in line with my frugal (tight fisted) nature, I note one of the voucher sites has a £79 for 2 offer for 6 courses at lunchtime that (if my meal was anything to go by) is a real bargain. Would I go back? 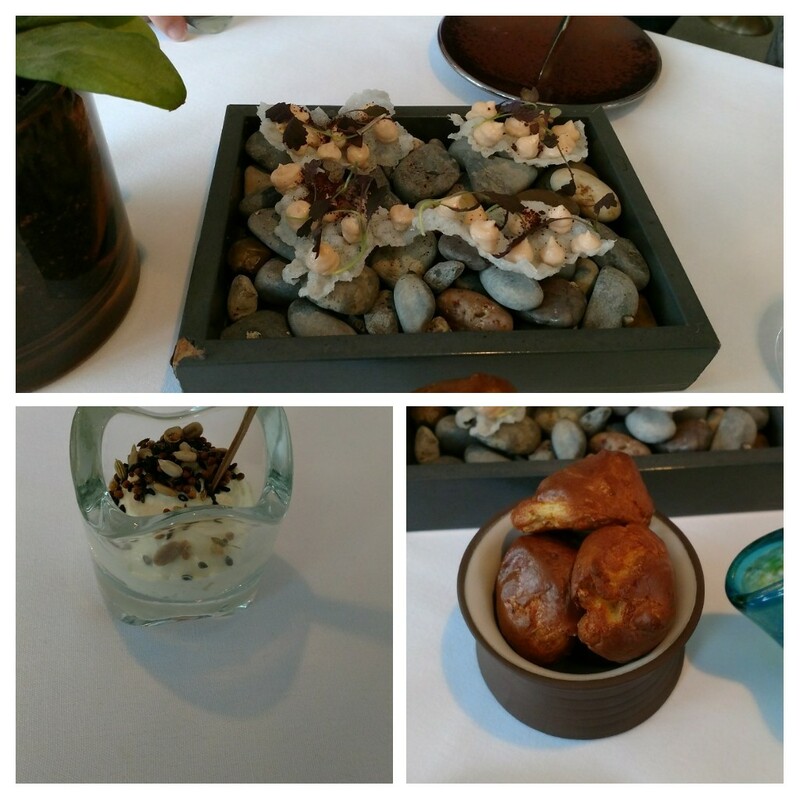 Yes – really lovely food. Wine prices, however, make it a “high days and holidays” only venue for me though. Opening times– Tues – Sun: Lunch from 12.00 (last orders 14.30); Dinner from 19.00 (last orders 21 30). The place also has 9 rooms. Staying here, with Penarth and the surrounding area on your doorstep, would make for a lovely, food orientated, weekend break. 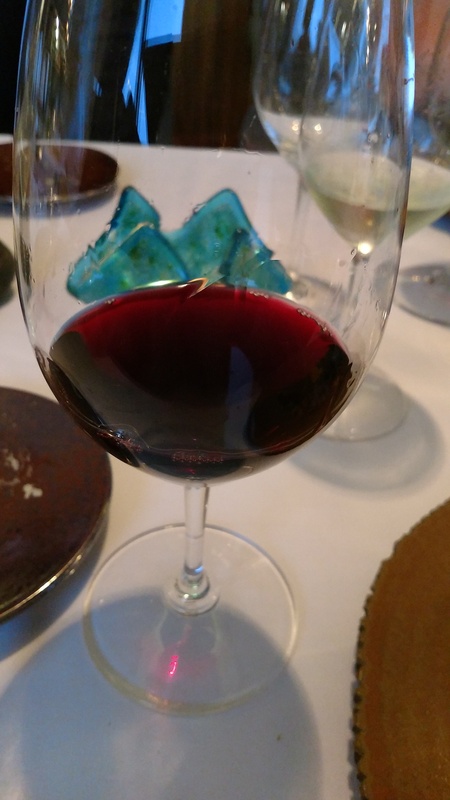 This entry was posted on Jul 2, 2017 by solicitingflavours in Alcoholic drink, Alternatives to sauvignon blanc, Australian wine, Cardiff, Cardiff restaurant, cheese, Drink, Dry white wine, Fine dining, fino, Food, Food and wine products, French wine, German wine, Gonzalez Byass, Gruner Veltliner, Ice cream, Jerez, manzanilla, Michelin star, Penarth, Port, Portuguese wine, Red Wine, Restaurant James Sommerin, restaurant review, review, Riesling, seafood, Sherry, Spanish wine, Tasting menu, Uncategorized, Venison, wine mark up, wine pairings.